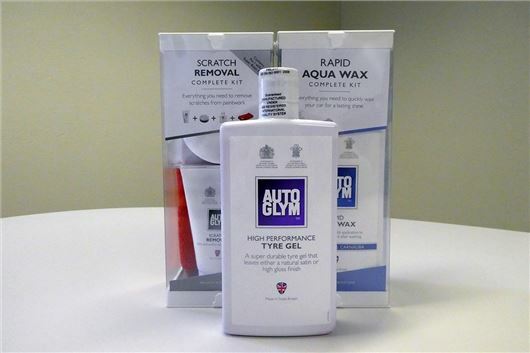 Autoglym has provided three products for our prize bundle - a scratch removal kit worth £17, an Aqua Wax kit worth £15.40 and High Performance Tyre Gel worth £10. Each of our 10 winners will receive all three of the products. The Scratch Removal Kit includes everything needed to treat larger paintwork scratches, with a scratch removing treatment and applicator, along with a polish and finishing cloth to shine up the affected area once a scratch has been treated. Aqua Wax is Autoglym's easy-to-apply wax, which can be sprayed directly onto a wet car and then buffed off with the included microfibre cloths. A 500ml spray bottle of Aqua Wax and two microfibre cloths are included. Finally, the Tyre Gel can be used to improve the appearance of tyre rubber. If left to dry it provides a high gloss finish, or it can be rubbed in with a microfibre cloth to give a more natural, flat finish.